This oil is also used in flavoring water and foods as well as for its fragrance in in perfumes and aromatherapy in addition to being added to furniture polish, grease removal (along with other citrus oils), and as a hand-cleansing agent. As far as aromatherapy goes, Sweet Orange Essential Oil helps people to relax, children to sleep, and the digestive system (like constipation and dyspepsia) while being used effectively on the immune system, colds, flu, and to eliminate any toxins from your body. A good diuretic, Sweet Orange Essential Oil is useful in balancing water retention, obesity, as a general tonic, as well as in cases of nervous tension and stress. Dilute a drop of Sweet Orange Essential Oil in 4 fluid ounces of liquid such as rice milk or goat's milk as a supplement or simply add 6 drops of Sweet Orange Essential Oil, 3 drops of Clove Essential Oil, 3 drops of Wintergreen Essential Oil, 6 drops of Peppermint Essential Oil, and 2 ounces of unscented massage cream for a foot and muscle massage blend. Add 4 drops of Vanilla Essential Oil and a drop of Sweet Orange Essential Oil to dab on your wrists, your neck, behind your ears, or blend with an unscented cream to use as a lotion. Even though Sweet Orange Essential Oil is nontoxic, non-irritant, and non-sensitizing, it may have photo-toxic effect and should not be applied before you go out into the sunlight for prolonged periods of time. If you are pregnant, nursing, or have a medical condition, please consult with a health care practitioner before using this essential oil. Always dilute this oil for both topical and internal use,especially before using it on such sensitive areas as your face, neck, and genital area. Keep out of the reach of children and pets. A sweet, fresh, and tangy hesperidum (that is, a berry with a tough, leathery rind whose peel contains volatile oil glands in its pits), the Sweet Orange grows on a small flowering evergreen tree that is native to China but is now extensively cultivated in America. Originally originated in Southeast Asia along with the rest of Orange family, the Sweet Orange (Citrus sinensis) is called so in order to distinguished it from the Bitter Orange (Citrus aurantium) and is also known as a “Chinese apple” or “China's apple”. Sweet Orange Oil is a by-product of the Orange juice industry just by pressing the peels of the juiced Oranges. 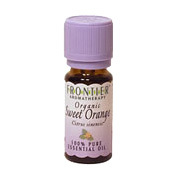 Orange Sweet Essential Oil Organic is shipped in a discrete, unmarked package. Orders are processed immediately and usually take about 3 to 5 working days to be received. We do ask that you try it for 2 to 3 weeks to feel the full effects. Any information received is used only for order processing and shipping purposes. Your information, such as e-mail address, will never be disclosed to a third party.